Spring Fair launched this weekend and we opened with a bang and brought the WOW factor. Not content with one new collection of greeting cards launching we stepped it up to a whole brand new company focussing on gift bags, roll wrap, tissue, notebooks, albums and china mugs, all of which is Belly Button to a tee in terms of ethos in design and quality. BUBBLE will stand alone as a company and taps into the experience we at Belly Button have in producing our own bags and licensing designs to fill the gap in the market for fresh design led product - see for your self. One of the strengths of this new venture is the partnering with a third party based in the UK who have all the production facilities in China so customers will experience the fast turnaround and great customer service already accustom to with us at Belly Button. To celebrate the launch of our new giftware company, we put on the bubbles for BUBBLE, and what a hit it’s been! Cactus, ferns, copper pineapples and flamingoes adorn the stand and if that doesn’t feel quirkily elaborate remember there’s the champagne! 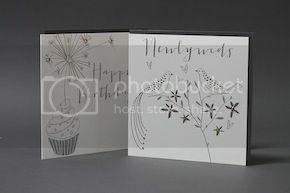 MALARKEY is a beautifully modern greetings card collection of illustrative collaged watercolors and glitter embellishment. We continually aspire to be ahead of trend in a fast paced market, so we've placed a central focus on unusual icons in this uniquely different offering that makes a bold statement with colour and concept. Big adventures are characterised by bold accents of blue creating a colour pop of freshness to deliver a vibrant new look in this collection, PALOMA BLUE, designed for men in mind! We bring you strong geometric patterns, classic captions and our iconic Platinum illustrations in our brand new trend inspired 2016 collection PLATINUM PINK & BLUE. Don’t miss out on the Belly Button love, there’s still time to come see us at Spring Fair HALL 3-3A STAND 3T11 and its a much needed treat for your optics - it’s not an illusion!